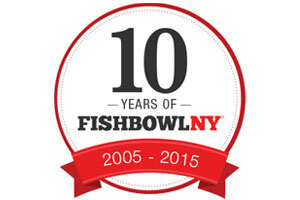 2015 is FishbowlNY’s 10 year anniversary. Happy birthday to us! Way back in 2005, when people were busy acting like they understood Syriana and 50 Cent still had a career, we were covering the media scene just like we do now. In honor of our 10th birthday, below is a look at some of the media story lines of our launch year. Enjoy the weirdness. For starters, we said that the king of bad press Donald Trump was successful because he “gets good press.” Word on the street is that Trump printed that post and has it hanging above his bed. Speaking of rumors, a hot item in 2005 was that incoming Businessweek editor Stephen Adler was going to clean house. This might come as a surprise, but 2005 Michael Wolff was the same as 2015 Michael Wolff — he hated everything. Wolff proclaimed that The Wall Street Journal was finished because it dared to charge people for access to its website. Wolff denied that he said this, even though it was so true. Why charge people for content? Absurd. In an item that should be filed under “Media Reporter Hot Takes,” we said that Esquire was the same as FHM or Stuff. Finally, in a post about Random House suing Diddy for not completing his autobiography, the phrase “wassup G” was used. For the record, we have still not recovered from that.